"Never let the facts get in the way of a good story" must be the motto at Reuters, or at least of the wire service's Richard Cowan, three other contributors, and Editor Jackie Frank. Cowan's late Sunday afternoon dispatch (HT to an e-mailer) is caricature-driven collection of cliches, half-truth, outright myths, and totally predictable oversights. There's the racial slurs before the heath care vote fabrication. There's an attempt to declare Sarah Palin unfit for the presidency. And of course, there's the deliberately avoided recall of rhetoric from President Obama (here and here, for warm-ups) that could certainly be interpreted by unstable people as a call to violence, as well as total omission of the left's anger just days ago over Gabrielle Giffords's refusal to back Nancy Pelosi as Minority Leader and the leftist inclinations of deeply troubled accused murderer Jared Lee Loughner. Now, in the aftermath of Saturday's Arizona shooting rampage that left a congresswoman in critical condition from a gunshot to the head, six people dead and 13 others wounded, some are saying it's time to reset the tone of America's political discourse. ... An angry America is no doubt the result of economic woes underscored by an unemployment rate that has been stuck at nearly 10 percent for a prolonged period. The Tea Party movement -- a loose union of conservatives who have mostly supported Republican candidates or have run as Republicans -- has capitalized on the uncertain times, winning dozens of seats in the House of Representatives and Senate. ... On a Facebook site in early 2010, (Sarah) Palin posted a map of the United States with cross hairs over 20 congressional districts held by Democrats she hoped would be thrown out of office. It included the seat held by Giffords. "It's time to take a stand," the posting said. -- I guess Cowan doesn't realize that probably the best-known Obama-Hitler mustache poster carrier was Rachel Brown, a Lyndon LaRouche supporter who confronted Massachusetts Congressman Barney Frank at a town hall meeting and challenged him in the Democratic (that's right, Democratic) primary last year. 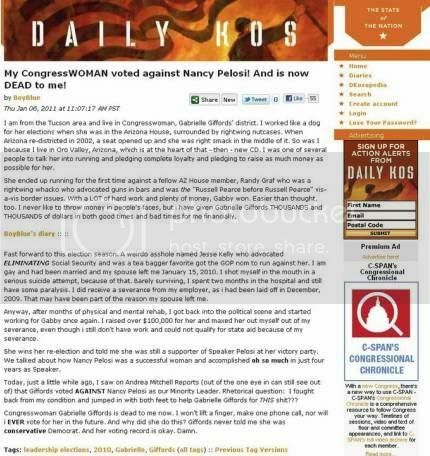 Cowan also seems to have "forgotten" how a different Democratic Congresswoman's supporters "participated in a Palin-as-Hitler rally" in September 2010. How convenient. The "Second Amendment solutions" audio with Lars Larson is here. The quote involved is: "I hope that's not where we're going, but, you know, if this Congress keeps going the way it is, people are really looking toward those Second Amendment remedies and saying my goodness what can we do to turn this country around?" When I hear "Second Amendment solutions," I think of so many people who have told me that they have felt the need to arm themselves and learn how to use a gun in case civil order breaks down. God forbid if that should ever happen, but if it does, it will largely be because Congress spends the next few years, as Angle said, "going the way it is" and destroying the country's economic and legal foundations. -- The "racial slurs were uttered before the health care bill" lie has been so thoroughly discredited that it's somewhat amazing that Mr. Cowan would attempt to resurrect it. But since he has, here's the video documenting that there is no record of any such thing ever occurring when it was alleged to have occurred. -- So "angry confrontations at town hall meetings" are the same as incitements to murder? What is amazing is how, to the leftist press, raised voices on the right are incitements to violence, while raised voices on the left are either not worthy of comment or even occasionally noble expressions of passion. -- Of all the "experts" Mr. Cowan could have gone to for commentary on Sarah Palin's civility and presidential prospects, the Reuters reporter picked a Youngstown State University PoliSci Chair who seems more than a little enamored of the late Surpreme Court Justice Hugo Black. That's right, Hugo Black, the FDR appointee with the initials "KKK" embedded firmly in his background. In a book review, Sracic is more than willing to forgive Black for this involvement, essentially considering it a necessary resume enhancement in the old South, without any thought as to how many cross-burnings and perhaps more violent activities Black's involvement might have entailed. Black also wrote the Supreme Court opinion upholding the World War II internment of Japanese Americans. Yet it's Sarah Palin who is apparently beyond the pale. You can't make this stuff up. Cowan and his collaborators' unsupported, poorly-sourced crabbing would be laughed out of a well-run ninth-grade social studies class. Too bad that the standards at Reuters aren't even that high.